We’d love your help. Let us know what’s wrong with this preview of Hallow Point by Ari Marmell. To ask other readers questions about Hallow Point, please sign up. Hard-boiled Fae detective Mick Oberon has quite the situation on his hands! The Spear of Lugh is somewhere in 1930s Chicago and every Fae faction (and a few in-the-know wise guys) want to get their meat hooks on it! Mick uses his brain-box a little more in this mystery (when he isn’t getting pounded by some palooka that is), although he still has problems with his thought processes when he’s around a certain dame. Good action, good complications, excellent title! I am particularly fond of Fast Fr Hard-boiled Fae detective Mick Oberon has quite the situation on his hands! The Spear of Lugh is somewhere in 1930s Chicago and every Fae faction (and a few in-the-know wise guys) want to get their meat hooks on it! Mick uses his brain-box a little more in this mystery (when he isn’t getting pounded by some palooka that is), although he still has problems with his thought processes when he’s around a certain dame. Good action, good complications, excellent title! I am particularly fond of Fast Frankie, the leprechaun. I still find this series a bit heavy on the Chicago gangland lingo—too many flivvers, floggers, bulls, molls, gats and what have you. But if you can overlook that, it is a fun little series. It is not necessary to read the books thus far in chronological order. The Protagonist:Mick Oberon is not just another private eye, he is fae. He is a Seelie Court Prince and Es Sidhe. He is also a hard-boiled detective living in 1920's Chicago. He packs a wand. His magical powers are limited, but he knows how to use them. The Plot: There has been a break-in at the Museum Of Natural History and the alarms did not trip. The Spear of Lugh, a powerful artefact, which makes the bearer invincible in battle is missing. The Seelie and Unseelie Courts and an agent of the infamous Wild Hunt; a mobster, are all hunting for the spear. Enter Mick Oberon. This book is a great urban fantasy read. It's fast paced, imaginative, gritty and funny. We also have the makings of romance in this one! Arnel creates strong supporting characters who are fascinating and funny. I was pleased to have Lady Eudeagh reappear. Books that allow the protagonist to be wrong have a special place because they enable the hero to be human, even when they are fae! More would be a spoiler. The downside would be the use of the F word, but I guess it reflects a time and type. I think this book has cross appeal. It is an intriguing mystery, a good urban fantasy with a hard-boiled detective. A captivating and stand out read. Hmm, not sure I may actually place this at 3.80. Very well done noir fantasy story. The plot was intriguing, going along with the Noir--PI, gumshoe-- plot lines. Neat idea of having what is basically a thousand year old elf as a Private Detective. So you get the good qualities of both genre. Descriptions were good, characters stayed in character, action well described. The plot was carried out and he didn't forget one or two plot points as you might think at the end when all parties are gathered Hmm, not sure I may actually place this at 3.80. Very well done noir fantasy story. The plot was intriguing, going along with the Noir--PI, gumshoe-- plot lines. Neat idea of having what is basically a thousand year old elf as a Private Detective. So you get the good qualities of both genre. Descriptions were good, characters stayed in character, action well described. The plot was carried out and he didn't forget one or two plot points as you might think at the end when all parties are gathered together, because that isn't the end. There are a couple points I wasn't sure about. One guy is killed rather bloodly and the why of it wasn't really explained well. Second, while the dialogue and descriptions go along with the Noir genre Ari uses one word over and over again that I wonder about. I don't recall that word being used in other Gumshoe tales. Or if Ari used it in the first book. My memory could be plying tricks on me as it sometimes does but that is what I remember. I didn't give it a solid 4 for a couple of reasons. One is those two things I listed already. just now, and that personally I didn't enjoy the story that much. It is good, I will read the next one, I recommend it, but I would not place it on my top level of likability. As I said that is personal and has nothing to do with his writing. Ari Marmell's Hallow Point is the second novel in the Mick Oberon series. Although it's a sequel to Hold Lead, Cold Iron, it can be read as a standalone novel. I haven't personally had a chance to read the first novel yet, so this review is based solely on this novel. Before I write more about this novel and its contents, I'll mention that I'm not a big fan of contemporary urban fantasy novels, because I've often been more or less disappointed with their quali Originally published at Risingshadow. Before I write more about this novel and its contents, I'll mention that I'm not a big fan of contemporary urban fantasy novels, because I've often been more or less disappointed with their quality (far too many urban fantasy novels tend to be of low quality or contain too many paranormal romance elements for my taste). Fortunately, every once in a while I've come across a few urban fantasy novels that are genuinely entertaining and deserve to be read by fantasy readers. Ari Marmell's Hallow Point is one of these good novels, because it's irresistibly entertaining and offers wonderful escapism to readers who enjoy urban fantasy. Hallow Point is excellent entertainment, because it's a cross-genre novel with elements of detective fiction, hardboiled crime fiction, pulp fiction and urban fantasy. It will be of special interest to readers who are familiar with Jim Butcher's The Dresden Files series, but it will also attract the attention of those who have read novels by Ben Aaronovitch, Tim Marquitz and other similar kind of authors. I also think that fans of crime fiction and pulp fiction will enjoy it. - The events take place in the 1930s Chicago. The author uses the first-person narrative mode to tell the story. - Mick Oberon's friend, Pete, needs Mick's help on a case, because there has been a mysterious break-in at the museum of natural history. Mick finds out that a spear has been left in the museum and taken away without any kind of explanation. - When Mick investigates things, he runs into Herne the Hunter who's connected to the Wild Hunt. Herne is looking for something and asks Mick if he has "it", but Mick doesn't know what Herne means by his question. A bit later Mick learns that Herne is not the only one who's interested in "it", because the Seelie Court and the Unseelie Court are also looking for "it". This is the beginning of a highly entertaining and satisfyingly gritty story for adults. Characterisation works well, because Mick Oberon is an intriguing protagonist. He is a private detective who could easily be mistaken for a classic private detective from the 1930s, because he wears a fedora and an overcoat. However, he's much more than a normal private detective, because he has pointy ears and a wand. He's a member of the aes sidhe and a former Seelie Court prince. He has his own mysterious past that he likes to keep hidden. One of the most interesting things about Mick is that he doesn't like machines, because they make his head hurt. He also has interesting opinions about certain things and persons. In this novel, Mick has quite a lot on his hands, because has to deal with all kinds of things, including the Seelie Court and the Unseelie Court. He also has dealings with mobsters. His life becomes complicated and challenging when he finds himself balancing between different factions who are looking for the magical and powerful spear. The other characters are also interesting and vividly portrayed characters. For example, reading about Queen Mob (aka Lady Eudeagh, Boss Eudeagh) is very entertaining. Queen Mob is a fascinating character, because she is the leader of the Chicago Unseelie. It's great that the events take place in the 1930s Chicago, because many urban fantasy novels feature modern settings. This kind of a setting is perfect for a detective story that has been blended with urban fantasy, because it evokes a nostalgic spirit of an age gone by when the world was different and moved slower. The author's way of using old slang and phrases that were used in the 1930s deepens the atmosphere in a nice way and adds style to the story (he uses such words as "flivver" for an automobile and "gink" for a man etc). The author manages to get the historical atmosphere, tone and attitude of the 1930s Chicago right. Everything feels believable and you can almost feel the atmosphere of the old world when you read the story. Because the old Chicago is known for different kinds of crimes and mobsters, the inclusion of these elements adds a nice touch of style and freshness to the story. In my opinion, Ari Marmell writes surprisingly well about these elements. Ari Marmell's bold decision to blend detective fiction and noir fiction with faeries and supernatural elements works perfectly, because it gives the rundown genre invigorating freshness. In his capable hands, detective fiction and fantasy elements blend seamlessly into a fast-paced and deliciously gritty story that both entertains and thrills the reader in equal measure. He manages to catch the reader's attention immediately, because he drops the reader in the middle of the happenings and then begins to move the story forward at a brisk pace and spices it with a few well-placed surprises. Ari Marmell has created an entertaining story that is refreshingly different from other contemporary urban fantasy novels. There are many familiar elements in this novel, but the author's way of writing about them feels fresh, because he avoids using the most typical clichés associated with urban fantasy. He has his own vision of the world and he makes it come alive with his fluent and effortless descriptions of the happenings. The author's sense of style and use of noir elements is admirable. I've often found myself being annoyed when authors have tried to add noir elements to their stories, but in this case I was amazed at the author's ability to write noir fiction. He seems to have understood what noir means and how it must be used to attract readers. I think that most readers, who are familiar with crime fiction and noir fiction, are aware of the fact that femme fatales and damsels in distress are often found in both genres. This novel also features a lady in distress, because Miss Ramona Webb needs Mick's services as a private investigator. The author handles this issue well and it's genuinely interesting to read about what happens to them and what is revealed about Ramona. One of the things that I've found fascinating in well written urban fantasy novels is that certain authors seem to be enthusiastic about mythology and like to add mythological elements to their novels. I noticed that Ari Marmell is one of these authors, because he writes intriguingly about the Spear of Lugh, the Wild Hunt and things related to the Fae. If there are readers out there who are not familiar with the mythological deity Lugh, I'll write a few words about him, because the Spear of Lugh is an important part of the story. Lugh is an Irish deity and he is presented in mythological texts as a hero and a High King of the distant past. He is known for his skill with a spear. References to the Wild Hunt are also intriguing, because the author writes well about it. There are probably many readers who are not aware of what the Wild Hunt is, so here are a few words about the Wild Hunt to those who are not familiar with it. The Wild Hunt is an ancient folk myth about a phantasmal or spectral group of huntsmen who are either dead or faeries. It's nice that the author knows how to use humour in a good and entertaining way. The dialogues between Mick and the other characters are good and some of them include sharp and stinging humour. Some of the sentences and expressions are so amusing that you may find yourself chuckling when you read the story. 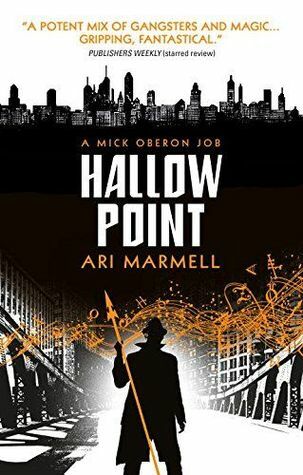 I'm not sure if other readers will agree with me on this, but in my opinion Ari Marmell's Hallow Point feels a bit like a combination of noir crime novels, pulp fiction and Jim Butcher's The Dresden Files with a tiny dash of the glamour and harshness found in HBO's Boardwalk Empire. The two sections at the end of this novel ("The Fae Pronunciation Guide" and "Mobsters in Chicago") offer interesting and useful information to readers. They're worth reading. Hallow Point was a pleasant reading experience for me. I don't normally read this kind of novels, but this novel impressed me. I enjoyed it so much that I intend to take a look at the first novel (Hot Lead, Cold Iron) in the near future to find out more about Mick Oberon and his life, because I'd like to have a bit more clarity on certain things. If you're a fan or urban fantasy and wonder if this novel is worth reading, I can say that it's definitely worth reading. It's among the best urban fantasy novel I've ever read, because it's something a bit different and it's very entertaining. I give it strong four stars on the scale from one to five stars. Ari Marmell's Hallow Point is an entertaining combination of different elements ranging from detective fiction to urban fantasy. It's a thrilling cross-genre novel that will be of interest to readers who want to be entertained by a good and gritty detective story with an interesting and well-portrayed protagonist. Good, well written and interesting urban fantasy entertainment! This was a very fun read. His vocabulary sometimes irritates me, but I LOVE Mick Oberon. Pete had way more development which was amazing. I love the little detail about Oberon breaking the news to him about being a werewolf. Pete is THE best character in this book. Fight me. Ramona. Please. Please just die. I'm somewhat joking. Point is, Oberon either has a weaker will than he lets on or Ramona is super over-powered. It's okay-ish now, but if she isn't taken down several thousand pegs in later books I'll be very annoyed and disappointed. Also it took him WAY too long to see through her. The moment he started describing every detail about her, oh, I knew she was trouble. For a detective, a Fae detective nonetheless, it took him forever to figure out he was being played. In this second installment of Mick Oberon’s cases in two parallel Chicagos, one mundane and one mystical, the eponymous snarky narrator returns with a darker tone. After his last job, Mick is tired, in both the body and mind, and he’s not keeping it a secret. The book’s atmosphere reflects this change in mood; it contains more gore, more language, and more despair than the first novel. However, it isn’t a disheartening read; while it’s not as jaunty as its predecessor, it’s entertaining and compe In this second installment of Mick Oberon’s cases in two parallel Chicagos, one mundane and one mystical, the eponymous snarky narrator returns with a darker tone. After his last job, Mick is tired, in both the body and mind, and he’s not keeping it a secret. The book’s atmosphere reflects this change in mood; it contains more gore, more language, and more despair than the first novel. However, it isn’t a disheartening read; while it’s not as jaunty as its predecessor, it’s entertaining and compelling. Its humor knows when to break the tension, and the absurdity of some situations and coincidences, courtesy of the world’s magic system, result in expert levels of literary drama. Plot-wise, it’s another “find the (x)” case; first, it was the changeling, and now, the priceless Spear of Lugh. The current case occasionally ties in with the previous, but most of the references are explained, and the story is strong enough to stand on its own. Mick has learned his lessons, and he makes sure to carry them over into his new goal. Even so, Mick’s development was a mismatched affair, as new character Ramona Webb provoked out-of-character behavior that even he commented on. There is a valid, in-world explanation for this that fits the plot and the universe Marmell has carefully constructed, but it doesn’t lessen the annoyance. Mick does revise his opinions on some of his prejudices and faulty ways of thinking, and it’s well-done, but the sprinkles of Ramona throughout soured the result. Nor does this novel add anything particularly new to the magic system; it still operates on luck and emotion, but as the first novel developed it so well, this isn’t quite a drawback as much as a marvel of his airtight worldbuilding. The two Chicagos are still expansive and defined, and Marmell introduces even more interesting aspects; the world feels truly infinite as new characters like Aebinn the banshee, and increased political intrigue, such as the maneuverings among the Seelie, Unseelie, and Wild Hunt, make their debuts. Unfortunately, the novel’s main pacing mechanism, and method of maintaining tension, quickly lost steam. It’s perfectly expected for a noir novel to contain phrases like, “A plan was forming,” or “I had a few pieces but I needed a little more to be totally sure.” However, to drag on Mick’s (almost smug) “I’ve-got-it” attitude without actually revealing what he’s deduced resulted in the tension melting into tepidity. In the second installment, the patois gets thicker and shakier. While occasionally, the writer manages a great turn of phrase, it's unfortunately far too precious to really enjoy. I think I'm done with this series. Last year Titan books unexpectedly published the first book, Hot Lead, Cold Iron in Ari Marmell's latest series, Mick Oberon. Before this I read Ari Marmell's Widdershins adventures. A young adult sword and sorcery and thiefing series. Which compared to this Mick Oberon series is quite something different. If you read my review of Hot Lead, Cold Iron, you know I liked the book and when I was offered to read Hallow Point. How could I say no? Hallow Point once again puts you right next to Personal Investigator Mick Oberon. If you read Hot Lead, Cold Iron, you know that Mick Oberon isn't your average joe. He is a Fae, with pointy ears included. He is the man in Chicago for solving the supernatural weird. In solving these crimes he doesn't use a gun as a sidearm but something much cooler in my opinion, a wand, and not just any wand. A Luchtaine & Goodfellow one. Hallow Point starts of in a rather eventful way. Mick is currently running away and trying to get out of a nasty situation alive. He is fighting a big monster in a museum, and even with the fae powers that he holds, he is still being outmatched and in this process he does loose the tip of his ear, which is of course highly annoying as it does make he fedora hat sit a bit awkward. Yes, fedora's are still in, in Mick's time 1930's Chicago! Mick soon find out that there is much more to this all, the creature he met at the museum is partly an acquaintance so to say... What happened at the museum doesn't go unnoticed and soon Mick finds himself right in the middle of everything. One important item has reached the city of Chicago, The Spear of Lugh, a very powerful relic, which every important player wants to get their hands on. As I already mentioned there is more than one person who want to have this spear, not only one of who runs the Wild Hunt, but also Seelie and the Unseelie courts. Courts where Mick is even more better acquainted with. And if that isn't enough, some other Chicago locals want to have this spear for their collection. It is up to Mick to make sure this spear doesn't fall into the wrong hands and of course to firstly locate it. A lot is depending on Mick's shoulders, if he fails, a lot more can and possible will. If I look at the first story, Hot Lead, Cold Iron and this story, it definitely falls to note that Ari Marmell doesn't hesitate one bit in building on the first story, so I do recommend that you start at the beginning of reading this series. That taken aside, Hallow Point, feels as a much more mature story. As Ari Marmell directly build on the storyline of the first book and on the foundation laid therein. This is something that I learned of him in his Widdershins adventures and there is showed it worked as it does so again in Hallow Point. By this Ari Marmell manages to keep the pacing very high and keeps you addicted and wanting to find out more. But as I said it does come at a small that makes jumping in with the second book difficult. One aspect that made Hot Lead, Cold Iron and that makes Hallow Point a blast to read is the main protagonist Mick. I love this guy. The way that he acts and thinks and reacts on certain events is just funny. Mick Oberon is as I mentioned above a Fae, and has a lot of connections in the Seelie and Unseelie courts and with other supernatural creatures. He does all his investigations in a long coat and a fedora hat which hides his point ears as well as his holstered L&G wand. And since the story takes place in the 1930's Chicago with mobster running loose, Ari Marmell has chosen to let this influence Mick's character. He talks just like you would expect someone of that time. It's done pretty cool, I really felt myself talking in that way after just a few chapter. If you liked the first one, you will likely like the second one. I've seen some comments that complain about the patois in this one and I can understand the complaint. It does feel a bit more pronounced, and maybe a little forced in places, but it doesn't really seem out of character so it didn't bug me. I mean the main character isn't /really/ a noir detective, he's a fae being /playing/ a noir detective so him being a bit over the top actually feels really appropriate. This book was even better than the first, which is saying a lot since I really enjoyed the first one. It's gritty, thrilling, intriguing and has lots of twists and turns that had me guessing. I'd think I'd figured out what was going on and then another swerve was added so I was completely baffled. Great fun! 3.5. . . I enjoyel the diction in this series. I don't know how closely it actually is to the language of the 1930's but it keeps me entertained. There were several twists towards the end that kept the plot interesting. The last chapter was action packed and I liked where this on ended. I will be reading the next one. Enjoyable read. A lot like Butchers series, but set in a different time period. Cool use of magic and entertaining. Like how the endings are a bit of a surprise and the characters are well developed as is the world building. A fun read, although everyone threatening everyone else every page got kinda tedious. The ending was drawn out. But fun. Good mystery/urban fantasy series set in 1930s Chicago about private investigator (and member of the Fae) Mick Oberon. The first person perspective is not an easy one to pull off in fiction. Despite this, it has been a favourite of the gumshoe genre as getting behind the eyes of a grizzled Private Investigator as they solve crimes and fall for femme fatales is incredibly satisfying if done well. All this is achievable, but what if you throw urban fantasy in too? Now you have a book that has to explain crime in the first person, but also magic and in the case of ‘‘Hallow Point’’, 1930s Chicago slang. Mick Oberon The first person perspective is not an easy one to pull off in fiction. Despite this, it has been a favourite of the gumshoe genre as getting behind the eyes of a grizzled Private Investigator as they solve crimes and fall for femme fatales is incredibly satisfying if done well. All this is achievable, but what if you throw urban fantasy in too? Now you have a book that has to explain crime in the first person, but also magic and in the case of ‘‘Hallow Point’’, 1930s Chicago slang. Mick Oberon is you typical 30s Chicago PI, investigating those crime that fall between the cracks. It just so happens that Mick is also a centuries old elf who can use magic to solve crimes and is usually hired to investigate the mystical, rather than the mundane. When an ancient spear turns up in the city it appears that every magical being in all the realms wants to get their hands/claws on it. Mick wants to be left alone, but somehow he always seems to be dragged into the action. When done well urban fantasy is an excellent genre; taking the normal and adding a magical twist. Jim Butcher is a master in his Harry Dresden novels and Ari Marmell is mining a similar seam with Mick Oberon – another magic user who solves crimes. The unique selling point of this series is that it is set in a version of the real 1930s Chicago, well known gangsters and all. This is a ripe period of criminality, backhanders and murder; Marmell should easily be able to set some dark fantasy here and put a twist on real history, but he fails. There are some fundamental problems with ‘‘Hallow Point’’ that detract from what is a solid PI book. As a straight forward take on the crime noir genre it has some things going for it. The setting is excellent and the sprinkling of real world gangsters into the mix is a great idea. It is just that the majority of the rest of the book loses its way. For one, this book falls into an increasingly common trap in urban fantasy of having too much action. Mick runs from action sequence to action sequence and the down time is not long enough for the plot to thicken to satisfaction. Rather than concentrating on the few characters that are already present early in the book, Marmell keeps adding more antagonists to the mix. By the end it feels like everyone is against Mick and he can’t stop to think, but neither can the reader. There is also a fundamental issue with the use of first person in the book. Told from the point of view of Mick, we not only have to read his slang, but also magical terms. Sometimes you get a sentence that contains slang, an abbreviated word and then a magical term. I was constantly drawn out of the book in confusion as I tried to work out what was happening. Using older terms is evocative, but using gotta or outta is just plain annoying. Quick! Name an urban fantasy series set in Chicago with a wisecracking, hard-boiled protagonist who solves mysteries while fending off coercive, seductive, and/or violent attacks from various magical factions. The Dresden Files, you say? Wrong! But if you enjoy the Dresden Files, then you are very likely to explode with pure delight over Mick Oberon. The two books in the series so far have been, in my opinion, miles better in terms of style, story, and authenticity than anything Jim Butcher has Quick! Name an urban fantasy series set in Chicago with a wisecracking, hard-boiled protagonist who solves mysteries while fending off coercive, seductive, and/or violent attacks from various magical factions. The Dresden Files, you say? Wrong! But if you enjoy the Dresden Files, then you are very likely to explode with pure delight over Mick Oberon. The two books in the series so far have been, in my opinion, miles better in terms of style, story, and authenticity than anything Jim Butcher has put out, and I think Ari Marmell writes circles around Butcher. YMMV and all that, but seriously - if you like Dresden even a little bit, give Oberon a try. Mick Oberon is a private detective in the corrupt, mobbed-up Chicago of the 1930's. He's also a prince in self-imposed exile from the Fae version of the city. In this, the second installment of his adventures, he finds himself at the focal point of a hunt by multiple factions, Seelie, Unseelie, mortal, and otherwise, for an intensely powerful artifact. As in any good noir story, there's a sultry dame, mob bosses and their goons, sketchy stool pigeons, gruff cops, and a stubborn hero whose mouth get him into trouble that his fists and gat - well, wand - have to get him out of. There are also redcaps, boggarts, a banshee, a rusalka, the Wild Hunt and a variety of other fae and fae-adjacent characters making his life difficult. The search for the mystical macguffin leads Mick all over the city, as he tries to piece together a puzzle that doesn't seem to make sense. As with the first book in the series, I very much enjoyed this combination of noir and urban fantasy. The plot is clever, the opponents are appropriately dislikeable, and all the noir elements are there (including a dangerous dame). Mick Oberon continues to be the principled, but pragmatic hero, setting out to protect everyone he can, at cost to himself. I noted, for the first book, how excellent the editing was. In this book, it isn't quite so good. There are some basic homonym errors that have As with the first book in the series, I very much enjoyed this combination of noir and urban fantasy. The plot is clever, the opponents are appropriately dislikeable, and all the noir elements are there (including a dangerous dame). Mick Oberon continues to be the principled, but pragmatic hero, setting out to protect everyone he can, at cost to himself. "a black dress so tight I wondered if she shed it monthly and grew a new one"
"I'd probably end up so dead I'd need a second corpse to hold it all." I loved the main character Mick Oberon. Also loved setting: the weaving of celtic mythology and 1930's Chicago was very unique. Loved the slang and the lingo; it really contributed to making this a fun read. Although things got resolved there was a lot of set up for future books. I will have to wait awhile to see what comes of some plot threads. But, all things considered I loved it. I won't bother with a summary, but I will say that I am very m What did I like about this book? I started by reading the second book in a series. This is never a great plan. It was about sidhe. Yes, elves, however you want to spell/pronounce bastid Gaelic. Actually, it was about one elf in particular, living in Chicago in 1932. I kept reading. Why? Because the author seemed to be having -so much fun- with the language. It moved at a rapid clip, interesting things, people, and things that looked like people kept happening, sometimes quite messily on the floor. Ending wrapped up the current prob I started by reading the second book in a series. This is never a great plan. A long time later.... finally done. It ended well enough for me to give it three stars but just barely and, at least for me, it was a series killer. Hallow point was basically a set up for Book 3. Oberon's marker from "Queen Mob" is called in, he has to find the spear of Lugh, but as it turns out it's a double blind. New characters are introduced, notable Ramona, and her mysterious boss. Good story, but a basically a set up for the big event in book 3.